Trees are zooming by on the tops of cars. It is that time. Ready or not. Thanksgiving is officially over and the Christmas season is underway. This weekend and next islanders will be out hunting Christmas trees. If you like to make a day of it and go out and cut your own tree, you will find the map below helpful. 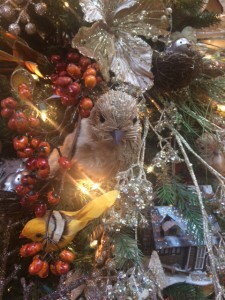 Next Saturday you could combine breakfast at The Farm Kitchen in Poulsbo with tree wrangling. I hear the rosemary apple sausage is on the menu. Not a bad way to spend a Saturday. Kick this season off with the Downtown Holiday Open House. Retailers will be offering a variety of specials. Free Horse Drawn Carriage Rides. The fun will continue at the Community Tree Lighting Ceremony at 6:30pm this evening on Madrone Lane. Enjoy music by the BHS Band and the Figgy Pudding Peddlers. Mary Poppins & Nutcracker Previews and more. Special guest, Santa Claus, will be on hand to help light the 2015 Community Tree. Manzanita Tree Farm provided this year’s spectacular tree. The Holiday Passport is back this holiday season. Pick up a complimentary Passport from a participating retailer. Collect a stamp when you spend $10. Collect stamps from businesses in the Passport and enter to win one of four Downtown Shopping Sprees. Visit Santa at Columbia Bank with your wishlist and have your annual photo taken by Nick Felky. Bring a non-perishable food item or cash donation to benefit Helpline House. Gingerbread Houses at KiDiMu. Mon-Sat 10:30 am-2:00 pm and Sunday 12:30-2:00. 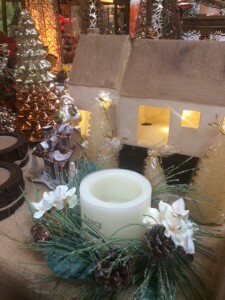 Decorate a take-home holiday creation at a self-guided decorating station. All materials provided. Free with admission or membership. More info at kidimu.org. If you pay attention to the real estate market here on the island, you should certainly have a sense that it is a seller’s market. The low supply and high demand is doing its job to tick prices upward. 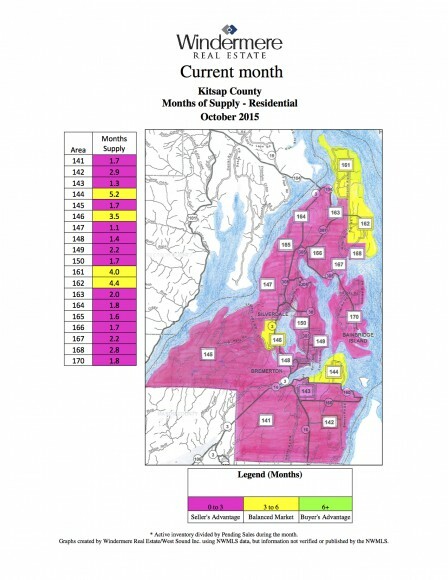 However, a glance at this map below gives you a vivid illustration of how Bainbridge, and a great deal of the Kitsap Peninsula, are now in a seller’s market. The Pink illustrates a seller’s market, the yellow a balanced market. The second image below compares 2014 to 2015. The Kitsap Peninsula trends to follow our market conditions, as Bainbridge follows Seattle’s market conditions. The seller’s market has moved in a wave west and spread across the Kitsap Peninsula since last year. 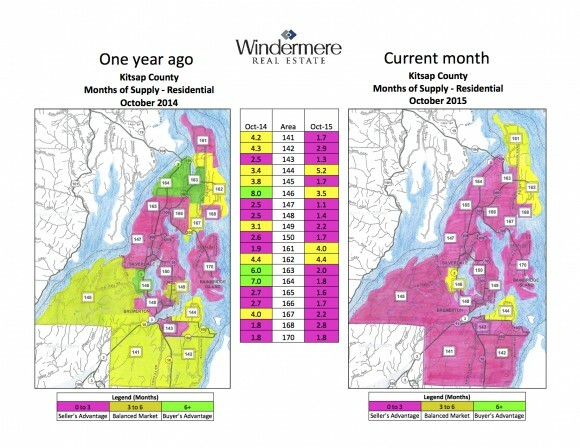 And our Bainbridge market has held steady at just under two months of available inventory. As of today 11/19/2015 there are only 66 active homes on the market. If you are thinking about becoming a seller, there is no better time. Many people pull their homes off the market this time of year, but believe me, the buyers are still here, waiting for their home to come on the market. I listed a home last week and it saw multiple offers. Buyers came out in the wind/rain storm to shop. They are motivated. A well prepared and well priced home should sell fast. In this market some sellers are pushing the price and putting their homes on the market unprepared. Buyers are motivated, but they are smart and well educated on pricing. Buyers are pushing back and we certainly have a slice of the market that is lingering. The home I listed last week with multiple offers was prepped for the market over a three week period. My sellers and team of photographer/stager/handyman/inspector worked hard. It paid off for my sellers. And, if you are a buyer, there are certainly ways to be successful. You need a plan. You need to be prepared. A smart buyer’s agent will help you be successful. I am happy to say my buyers rarely have to bid on a house more than once. We are typically successful on the first attempt. My strategies are tried, true and proven. If you are a buyer, I’d love to help you be successful in our market too. Our Bainbridge Island Real Estate Market has seen impressive price increases in 2015. Now, as we look ahead to next year, we are all wondering what 2016 will look like. Will prices continue to go up? Will interest rates go up and slow down price increases? 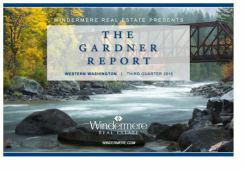 Click here to read the 3rd Quarter Report by Windermere’s Chief Economist Matthew Gardner for his educated insight.